Does the iPad fit in the business environment? Since the iPad was announced and introduced by Apple earlier this year, all of the PC and Mobile handsets vendors are rushing to deliver their own tablet. But is there a market for the tablet? More importantly, does the iPad/tablet fit in the business environment? 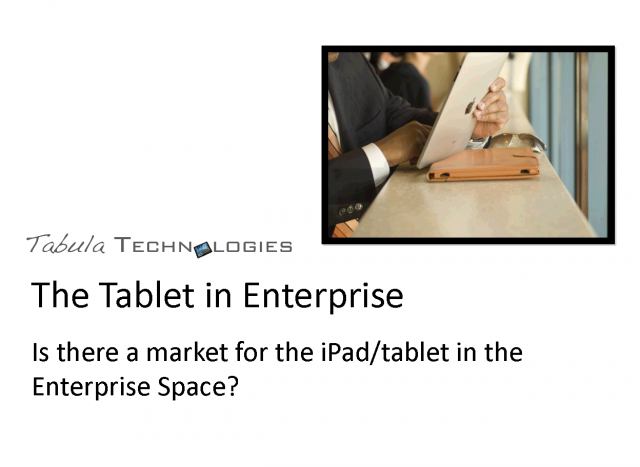 What is the value-added benefit of the iPad in the Enterprise space? Tabula Technologies is a Mobile Apps development company focused on the business market. We have years of experience building mobile solutions for businesses and we think that Mobile Apps is the latest technology for businesses to expand their service offerings and delivery. In partnership with the business, Tabula Technologies develops a coherent mobile strategy and solutions to add value and differentiation using the iPad, tablet and other mobile devices. Tabula Technologies understands that not all environments are alike. That is why we take the time to consult with you, from beginning to end, tailoring the solution to your needs and requirements. Combined with our creative and artistic minds we take full advantage of the high-resolution multimedia capabilities of the iPad, using Apps developed in-house or 3rd party Apps, to provide a feature rich solution that fully integrates in your environment. Title: Does the iPad fit in the business environment?